Games are always a big part of New York Comic Con, and while there was no definitive show-stopper at this year’s event, there was still a whole lot to see. A massive crowd cheering on bouts of Street Fighter V blocked the show-floor entrance, and some of the longest lines at the convention were for brief demos of Dark Souls III and Mirror’s Edge Catalyst. Those are all sequels and known quantities, though. I came to find things I didn’t know much about yet, so here are the new games that caught my eye at New York Comic Con. Yo-Kai Watch sponsored a “family lounge” downstairs as a place where parents and youngsters could relax away from the cacophony of comics and cosplay, all while being surrounded by the impending media blitz for the Japanese craze. There were comics from Viz Media, toys from Hasbro, and the Nintendo 3DS game from Level-5. The game demo was fairly straightforward, with a boy running around town trying to find and battle ghosts who were troubling the villagers. This felt similar to the overworld areas of Pokémon or Mega Man Battle Network, only with that Level-5 sheen that made games like Professor Layton and Ni No Kuni so charming. The battles took place mostly automatically, so I (and the young kids with short attention spans) didn’t need to navigate through all the menus of the game’s typical turn-based system. I did have the freedom to focus attacks on specific foes and swap out my teammates on-the-fly, but my eye was focused on the “Soultimate” attack gauge. Each character had a special attack that played out as a touch screen mini-game—tapping moving icons, spinning a wheel, or tracing shapes—lending battles just enough action to keep things from getting stale. My favorite part of the Yo-Kai lounge, though, was the medals included with all of the official Hasbro toys. Each toy comes with one or more of these plastic discs that looked a lot like pogs—remember pogs?—that fit comfortably into the replica Yo-Kai Watch so kids can make believe they’re in the game/cartoon/comics. In a surprisingly modern take on cross-promotional synergy, each of these discs also features a QR code to unlock the character in the 3DS game, and a free mobile app uses augmented reality to project 3-D models of the characters onto your phone/tablet and add them to your catalog. The discs act like baseball cards and the app like a Pokédex. I instantly pictured a younger version of myself blowing his allowance on Yo-Kai medals instead of X-Men trading cards. Cryptozoic Entertainment had been sending emails for weeks reminding everyone to check out the Ghostbusters board game at its booth, but I was instantly sidelined when I approached the table and saw a tabletop adaptation of Valve’s Portal series, titled Portal: The Uncooperative Cake Acquisition Game. The staff informed me that the design documents came straight from Valve itself and all Cryptozoic did was manufacture and package, so my hopes were high for an authentically Portal-like experience. Four players each take control of a group of test subjects, moving them through the familiar series of chambers that make up the board. 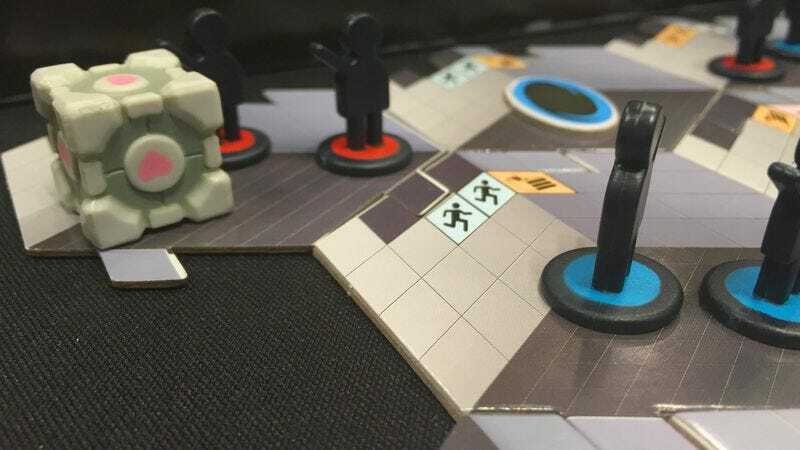 Portals connect distant test chambers, companion cubes distract the testers, turrets eliminate enemy subjects, and a deck of action cards change testing rules on-the-fly, much like popular card game Fluxx. The board game’s defining feature, though, is that each turn ends with one chamber “activating” at the far end, which flips that tile and places it back at the start, making sure the board is a continuous conveyor belt of death traps and the action moves along at a swift pace. The game is over when any one player loses all of their test subjects, at which point, the player with the most pieces of cake wins. It was a lot to digest, but the game moved smoothly and was a lot of fun. I could definitely see playing this at home, though I doubt it would be as charming to people who aren’t already familiar with Portal. With all these new games everywhere, I started to feel the need for something familiar, so I worked my way over to D3 Go!’s booth to see the console version of Marvel Puzzle Quest. I’ve been playing the free-to-play mobile version of the game for more than two years now, so I was very curious to see how the upcoming home game was any different. As one might expect, it plays almost identically: match-three-style puzzling mixed with a dash to power up your team’s special skills and wipe out your opponent. Aside from the mobile game’s daily and weekly challenges, the console version boasts nearly the game’s entire first year of content, recreating 2009’s “Dark Reign” storyline from Marvel Comics (where the Green Goblin becomes chief of police for Earth, leads a new team of evil Avengers, and all the heroes generally run away for a while). The biggest changes are the addition of local multiplayer and that all of the characters and their abilities have been rebalanced, since the game no longer has to bow to a free-to-play model where stronger characters are harder to come by. In this console version, the Iron Man you start out with can be used just as effectively as the Hulk you unlock later on, so no more weak characters falling by the wayside—a wise decision for Comic Con, as you don’t want to offend any cosplayers by suggesting their favorite character is less valuable than others.